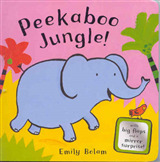 This is an illustrated, interactive pull-the-lever board book for very young children. 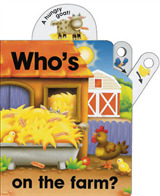 Children will love seeing the images pop up in this fun question-and-answer board book! Every page asks a simple question, and a special lever reveals the answer in a pop-up picture. 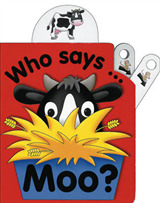 Other titles in this series include "Who Says Moo?" "Who's on the Farm?" 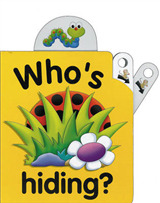 and "Who's Hiding?" 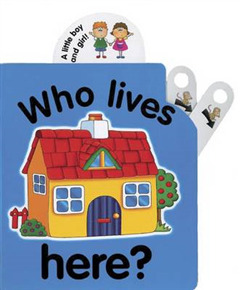 Flip the lever to find out who lives in the beehive, web, kennel and shell in this interactive storybook. Little hands will love pulling the sturdy levers and finding out who lives where, while the friendly animal characters in this book will delight your child as you read together. 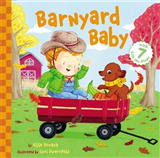 This is an engaging book, printed on thick board pages, is full of bright, bold illustrations and brings early learning concepts to preschool children.